Summer is time of “sagre” in Italy, because what’s better than traditional food enjoyed in a balmy evening, immersed in a friendly atmosphere? What you may not think about is the whole lot of work that lies behind these events: months of planning, days and days of cleaning, both before and after, costs, coordination of -often not- numerous volunteers who may or may not be that apt to carry out the tasks they’re given… And the ubiquitous, dreaded “last minute drama” that, I can guarantee you, always sneaks in between a veg prep session and another. The reason I know about all this stuff is because, for the past three years, I have been helping out during the three-days long Sagra di Sant’Anna in the town where I live, Pietra Ligure, on the Riviera delle Palme. The sagra is organised by the parish and I’ve been regularly enlisted to chop tomatoes and peppers and, during the evening, to take care of the pasta station. This year I found out that eyeliner I spent a fortune on for my birthday was worth every cent because, even after hours of sweating and hot pasta steam hitting my face, it didn’t budge one iota. Nevermind that, though, this isn’t a make up review. So yes, I’ve been helping out at the sagra. Things went pretty well and the food, I must say, was delicious: fried anchovies and calamari, focaccini (Ligurian fried bread dough), roasted sausages, ravioli al ragù, trenette al pesto, watermelon, crostate. But the absolute winner of this food bonanza were, without the shadow of a doubt, the trenette al sugo di pesce spada prepared by one of the ladies running the whole show, Annalisa. People kept on coming back to say how good they were and we struggled to keep up with requests. By the final evening of the sagra, many had come to try them because their neighbors at the beach told them to do so. A total success. Pesce spada, in all its declensions, is a typical ingredient in Ligurian cuisine and, more in general, in that of all our seaside regions. My neighbor is from Naples, lived most of her life in Sicily and she also counts pesce spada pasta sauce among her kitchen favorites. 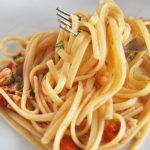 As the recipe for this sauce is relatively straight forward, I thought of adding it here: you’ll see, you don’t need strange ingredients or any particular culinary skill to prepare it, yet, it’s bound to wow your guests. I chose “trenette” here, but you can really pick whichever pasta you like. This sauce is fantastic with short pasta like penne as well, and paccheri are a favorite in Campania. As we always say in Italy, you should refrain from putting parmesan on it, as cheese on fish based pasta dishes is a bit of a no-no…but hey, if that’s what you like to do, go ahead! Let's start from the fish. Make sure you get fresh swordfish cutlets for this recipe: the fish needs to be high quality, so that it doesn't "melt" entirely into the sauce while cooking. Remove the skin around the cutlets, then cut it into cubes of about an inch. Set aside. Wash the cherry tomatoes, dry them and cut them in a half. Once you're done, heat up the extra virgin olive oil in a pan and add a clove of garlic. You should keep it whole, so you can remove it whenever the sauce has taken up a bit of flavor. Once the oil is hot, add the tomatoes. Add salt and pepper to taste, so that the tomatoes release some of their water, then add the capers to the sauce. Cover with a lid and let it simmer for 20 to 25 minutes on low heat. You should obtain a sauce where the tomatoes maintained part of their shape, but already started to turn into purée. Take another pan, add some extra virgin olive oil and another clove of garlic to it. When the oil is hot, add the swordfish and sauté it, adding some salt to taste. After a minute or two, add the white wine to the fish and let it cook gently for a few more minutes. You won't need too much time: swordfish cooks quickly enough and you want it to keep its texture. Once it's ready, mix together the swordfish and the tomato sauce, stirring gently on a low heat for a couple of minutes. Bring water to the boil and add salt to your taste. 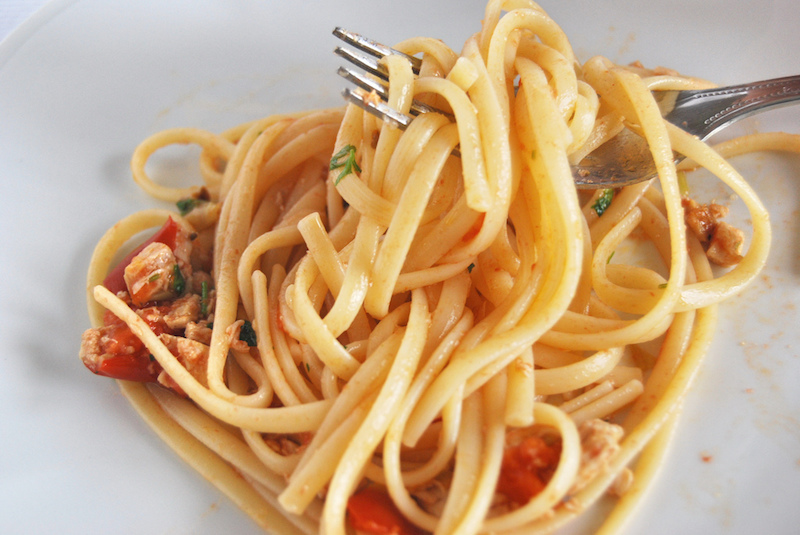 Cook your trenette (or linguine) following package instruction. My advice is to keep them slightly more "al dente" than you would usually do, as you'll need to sauté the pasta with the sauce before serving. Once the pasta is ready, drain it and keep some of the cooking water aside. Heat up the sauce, add the pasta and stir gently, adding some cooking water if you notice the sauce's too thick. Once the pasta is well coated, turn the heat off, plate and serve with some chopped parsley on top. This sauce should be enjoyed straight away and shouldn't be kept for more than one day in the fridge. If you'd like to give it an extra kick, you may like to add some salted anchovy fillets to the tomatoes, or some fresh thyme and mint. White wines are preferred here. You should go for something light and not too sparkly. Bianchetta Genovese DOC, Melissa Bianco DOC and San Vito di Luzzi DOC are all good matches.